Let’s talk ‘Beer’ — Oktoberfest Munich! The Beer Serving Hours are: on weekdays from 10.00 am – 10.30 pm. Tents are open about 1 hour longer for you to get tha last beer down. On Saturday, Sunday & holidays from 09.00 am – 10.30 pm. Two tents are open a little bit longer: ‘Käfers Wiesnschänke’ and ‘Weinzelt’. Usually, if you go late afternoon you will not get a seat in the beer tents anymore and tents close the entrances once filled. Waiting lines in front of the tents are long and frustrating. Go early! The unofficial rule is ‘don’t go later than 2:30pm’ on weekdays. On weekends it’s best to go before noon. Beer price per 1 Liter mug: averages around 11.5o Euro in 2018 — pricing depends on the tent. Munich Beer Festival – the Oktoberfest: The Munich “Wies’n” (how it is called by locals) is the world’s largest folk festival with 6+ million visitors. On an average people drink 6.5+ million Liters, known as a “Mass”, of the especially quaffable Oktoberfest beer, whilst eating more than 100 oxen and around 80 calves. Almost half a million roast chickens (“Brathendl”) are consumed in the two weeks on the Theresienwiese, over 100,000 pairs of pork sausages and some 80,000 pork knuckles. Note: it’s more or less impossible to find any parking space for your car. Take public transportation. The subway station is directly at the entrance. Ideal underground transportation is: Subway U4 or U5 to “Theresienwiese” or “Schwanthalerhöhe”. The Oktoberfest has its origins in the celebrations of the marriage of Crown Prince Ludwig, later to become Ludwig I of Bavaria, to Therese von Saxe-Hildburghausen in 1810. The Oktoberfest grounds in the centre of the town are also named after her: the Theresienwiese (Wiese meaning meadow), affectionately referred to by Munich folk as the “Wiesn”, which has also become the term for the world’s biggest funfair itself. Every year in the last week of September, this huge area at the foot of the statue of Bavaria is turned into a vast “Festwiese” for 16 uproarious days until the beginning of October (the Oktoberfest always begins on the (second-) or last Saturday in September and ends usually on the first Sunday in October). The Wiesn is a festival for all the senses, a merry mixture of sideshows, traditional roundabouts, high-tech switchbacks, a Ferris wheel and “Super Loopings”, small and larger sales stands for such delicacies as candy floss, gingerbread hearts and roast almonds or for balloons, stuffed animals and other souvenirs, and, of course, the “landlords’ alley” with the 14 beer tents of the Munich breweries. Ca. 6+ million people visit the Oktoberfest each year, drinking about 6+ million liters of beer. Beer is served in 1 liter mugs. To order a beer you don’t say: ‘Ein Bier bitte’ (one beer please). You say: ‘Eine Mass bitte’. All six of Munich’s major breweries are represented with seven “Festhallen” — that’s the name for a beer tent. The largest tent – Hofbräuhaus – seats over 10,000 guests. In the Spaten-Franziskaner-Bräu festival hall the tradition of roasting oxen will be continued. Alltogether, there are 13 big tents for beer lovers and about 10 small tents but wine lovers should go to the ‘Wine Tent’. Most English speaking folks are usually found (onto or sometimes under the table) in the ‘Hofbräu Zelt’. The price for 1 liter beer is ca. 11.oo and above — it varies slightly from tent to tent. Yes, tipping is expected by the strong ladies who serve you the beer. The price for non-alcoholic beer is not higher than the Oktoberfest beer. Remember, you order a beer by saying: “Eine Mass bitte”. A ‘mass’ is the correct bavarian expression for a 1-Liter beer mug (certainly filled with beer). The Oktoberfest is famous for pork knuckle (in German: Schweinshaxen) and roast chickens, but there are certainly plenty of other Bavarian and German delicatesses like ‘Bratwurst’, ‘Weisswurst’ (mostly only until 12 noon), ‘Brezen’. A wide range of entertainment-businesses, carousels, shooting and throwing galleries, attractions for children and nostalgic merry-go-rounds can be found on the grounds. This year altogether 650 businesses have been admitted. Apart from the 14 festival halls – popularly known as “beer tents” – of the major Munich breweries and the other large catering companies, there are about 65 medium-sized and small catering firms as well as other sales kiosks for tobacco, sweets, ice cream, fruit, souvenirs, espresso and a stand for milk and milkshakes. Among others you’ll find several roller coasters, merry-go-rounds, chain flyers, etc. There are also 38 shooting galleries and 38 stands for games. The festive setting for the opening of the Oktoberfest is the entry of the festival hosts and breweries. During the ceremonial opening of the fest, the families of the festival hosts in coaches adorned with flowers, the bands of the festival tents, the waitresses on decorated carriages and the magnificent horses and carts of the Munich breweries enter the festival-grounds; this procession is lead off by the “Münchner Kindl” – Munich’s symbol figure – on horseback, followed by the festival coach of the Lord Mayor. It was first held in 1887. The procession of folklore and marksmen groups is seen on the first Sunday of the Oktoberfest. Some 8.000 persons from Germany, Austria, Hungary, Italy, Lichtenstein, Poland, Rumania, Switzerland and other European countries participate in this festival parade which is some six kilometres long. Highlights are historical uniforms, marks-men, folklore groups, local bands, bandsmen and thoroughbred horses. This folklore procession was held for the first time in 1835 on the occasion of the silver wedding anniversary of Ludwig I. and Therese von Bayern. A bigband open-air concert of all Oktoberfest bands with some 400 musicians takes place on the second Sunday of the festival. For the grand finale of the Oktoberfest on the last Sunday some 60 marksmen salute their farewell accompanied by the band of the marksmen’ tent. Typical for the Oktoberfest are the popular traditional attractions which have again been admitted like the show “Off We Go At Schichtl’s”, the “Re-vue der Illusionen” – a show of historic fair illusions, the old-fashioned merry-go-round “Krinoline” with live music, an old Russian Wheel, Punch-and-Judy-Shows, the “Zugspitze-Railway”, the toboggan, a devil’s wheel and the witches’ swing. In the following we describe some of the big tents on the Oktoberfest and give an overview about other great but may be smaller tents. By the way, a synonym (and also the common term in Bavaria) for Oktoberfest is “Wies’n”, so, don’t be confused if we use the term in the article or if you hear it while in Munich. Only people from outside Munich / Bavaria use ‘Oktoberfest’, locals say Wies’n or Wiesen. Another pre-requisite is: the word “tent” is translated in German as “Zelt”, so Wies’s Zelt means Oktoberfest tent. It all began with just one small shed behind the King’s marquee in 1867. Fewer than 50 people could fit inside Michael Schottenhamel’s new Oktoberfest restaurant. Today, the tent and beer garden can seat 10,000 people. Schottenhamel is also the venue for an annual Oktoberfest tradition. At 12 noon sharp on the opening day, the first keg is tapped by the Mayor of Munich to the famous cry of O’zapft is! Only then can the other tents begin to serve beer. The Hofbräu Tent is the second largest at the Oktoberfest and can accommodate exactly 9,992 people. This includes the 1,000 standing places in front of the music stage, which is the only one of its kind on the Oktoberfest grounds. Every year, twelve hundredweight of hop vines from the Holledau region are attached to the ceiling as a beer-themed decoration. 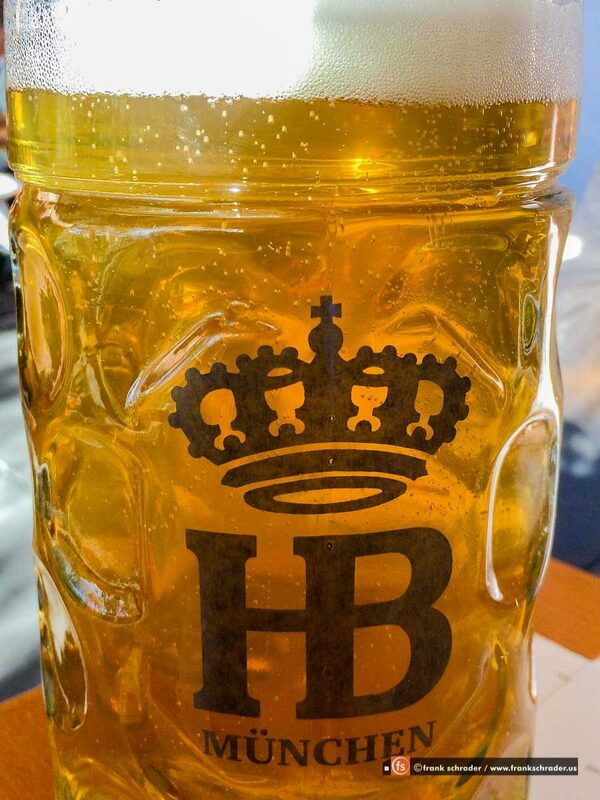 Tuesday is family day at the Hofbräu Tent: 600 seats are reserved for parents and their children from 11am to 3pm. Editors note: The Hofbräu Tent is the classic tent where each year travelers from all over the world, mainly Australia, New Zealand, United States, Canada, meet up. Augustiner-Bräu of Munich makes a special Oktoberfest beer which is served only during the event and only from traditional wooden barrels. The brewery’s beer tent seats 6,000 people inside and 2,500 people outside. Proprietor Manfred Vollmer and his team, which is considered one of the friendliest at the Oktoberfest, serve hearty food to hungry revellers. The Augustiner Oktoberfest band led by Reinhard Hagitte keeps the atmosphere jovial. The Ochsenbraterei, otherwise known as the Spatenbräu festival tent, is represented at the Oktoberfest since 1881. What began as a ‘mechanical ox rotisserie’ run by the butcher Johann Rössler is now one of the biggest tents on the Theresienwiese and offers authentic oompah music along with the food and drink. Today, the oxen are roasted whole on a modern spit but taste as good as they did back then. As long ago as 1895, the Winzerer Fähndl archers’ guild opened their first Oktoberfest tent to serve crossbowmen and their guests and to host shooting competitions. The German Crossbow Championships are held at the Oktoberfest to this day. An annex to the main tent contains the 30-metre ranges. Brassbands enliven the atmosphere with waltzes, oompah music and party classics. The Hippodrom opened for the first time in 1902. It was the first Oktoberfest beer tent to offer amusements along with the food and drink. For a fee, visitors could ride around the indoor ring on one of the 25 horses. Sepp Krätz’s beer tent, which has won multiple awards for its outstanding service, is offering an accomplished mix of Bavarian tradition and international charm at the Oktoberfest. … a smaller tent, often popular among celebs and wanna-be’s. … yes, a wine tent. For all of you who don’t like beer but want to be on the Oktoberfest!? … the actual name is Käfer’s Wies’n Schänke. A small tent which is for people you don’t like the ‘real, genuine’ rustic Oktoberfest atmosphere. Here you can still sit with your table cloth and be amongst celebs and wanna-be’s. … a traditionial tent on the Oktoberfest which is a institution since 7 generations of the Heide family. … is a small, probably the smallest beer tent on the Wies’n. … is a real traditional institution on the Oktoberfest. Genuine beer tent atmosphere. Where to get what beer? Note: a “Festhalle” is the German word for beer tent (in this context). There’s plenty of good food on the Oktoberfest. You can eat in any beer tent and also in one of the specialized food stands and booths. Some offer seating and others are just a booth for take-out. The following places are also often used as meeting points and re-gathering points since it’s not as crowded as in front-of the big tents. … is an eatery offering fish. Certainly you’ll get a beer in here as well. … famous for the Hax’n and offers also seating. The grand parade of festival publicans and breweries marks each year on the first day of the Oktoberfest the official start. Starting at 10.50 a.m., the procession will take about an hour to make its way from Sonnenstrasse to the Theresienwiese festival grounds. It features the families of the festival publicans in carriages adorned with flowers, waitresses waving beer mugs on festively decorated floats, the brass bands that play in the beer tents and horse carriages representing the Munich breweries, beautifully turned out and carrying garlanded beer barrels. The Oktoberfest performers, market stall holders and serving staff of the smaller beer tents will also arrive on a decorated float. In total, there will be about 1,000 people taking part in this spectacle. The procession, which dates back to 1887, will be led by the ‘Munich child’ mascot on horseback, traditionally followed by the city‘s mayor in a festival carriage.